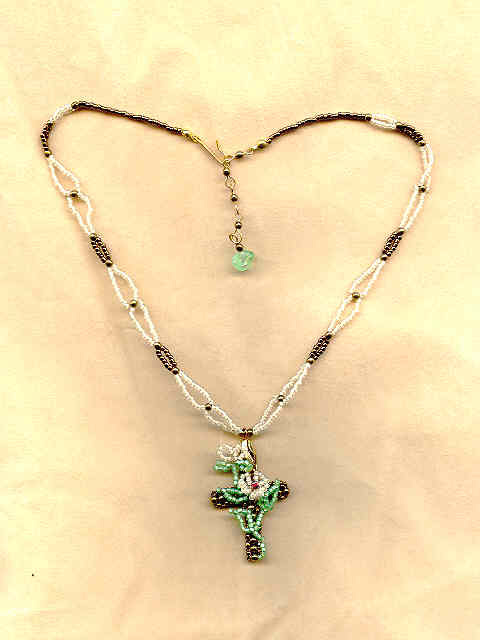 The cross is a combination of bronze-colored 3mm Czech glass beads and matching Japanese seed beads, painstakingly woven together. The lilies and leaves have been wired to the front of finished cross, and then the entire pendant has been suspended from a looped strand of bronze and ivory seed beads. The hook and extender closure gives the strand a working length of from 17-1/2" to 18-3/4". 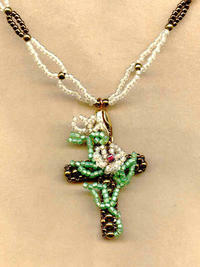 The cross is approximately 2" long by 1-1/4" wide. As charming as it is inspirational, it's from SPARKLE PLENTY, of course.